ARTsolar is proud to announce locally guaranteed solar panels in stock. We are proud to announce that we now have 320Wp, locally guaranteed, PV modules in stock, and soon we will also be able to provide 270Wp solar panels at competitive pricing. These modules have been put through the strictest of QC processes during and after production to ensure that your investment is backed by world class quality standards and a locally honoured warranty system. No international arbitration. No language barriers. Proudly South African. 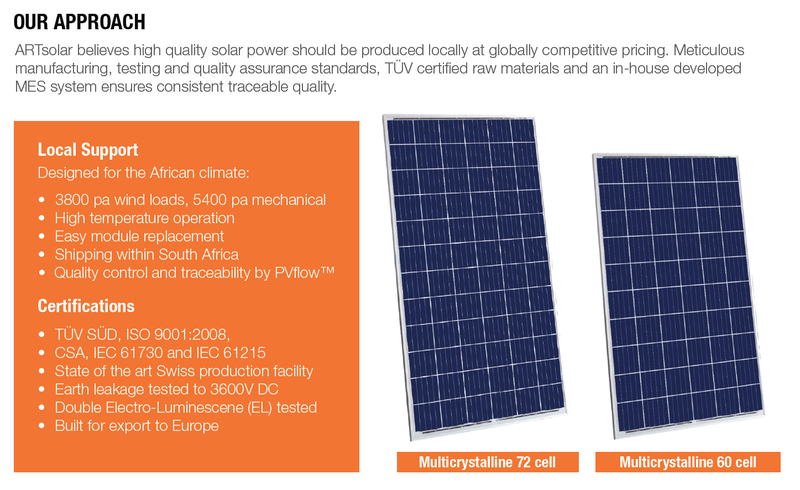 Our new modules have been built to survive the harsh African climate and are produced from the latest in 5 bus-bar technology cells, our raw materials have been supplied by world leading manufacturers and backed by their outstanding quality, knowledge and support. For more information, download our DATASHEET or CONTACT US for a free quotation.